For years Australian parents have been battered, bruised and frustratingly wounded when navigating the minefield that is their house. From LEGO to dolls, from balls to blocks, from toy cars to trains – the household of the modern parent is a battleground! Half of the battle is managing to avoid stepping on the endless array of small plastic toys while the other half is encouraging our little delights to clean up their chaos! More often than not, once the kids are in bed, it is left to the parents to navigate the minefield and tidy up the mess while praying for no more toe casualties. Considering that when women become mothers, their time spent on housework increases from a weekly average of 16 hours to 25 hours (The Australian Institute of Family Studies) - it would be very helpful if our little ones were as passionate about clean up time as they are about play time! 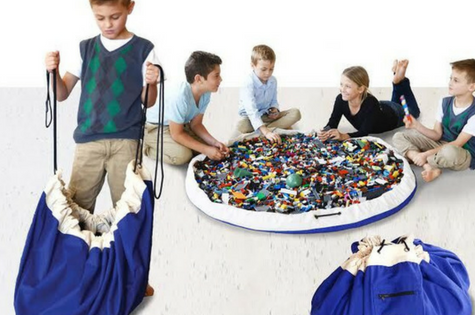 Luckily, our Australian friends at Play Pouch have created an innovative, stylish and practical storage solution that maximises creative play while minimising mess and empowering achievable fun pack-up for children! Designed by Mums for Mums and crafted using on the highest quality materials, the Play Pouch is available in two stylish ranges of Original ($59 RRP) and Printed ($69 RRP) and is made of a durable canvas with secure ropes, high quality eyelets and a handy zip pocket that kids will love to store their treasures in. More than just a functional product, the Play Pouch doubles as an interior styling piece with a variety of colours and prints available to suit and compliment every Australian family and their style. Gone are the days of dreaming of an endless underground rumpus room, to lock away the clutter and toys of Christmas past. Play Pouch is a place to play and then simply pack away! We were experiencing stale air coming out from past several months and it is almost impossible to live in such environment, especially in the summers. We came to know about Duct Cleaning Melbourne and their outstanding services through our neighbors. Being influenced by the recommendations, we contacted the experts with the complete details of our problem through the website form. And, as per the expectations, we got a prompt reply from the duct cleaning experts of the company, and within a couple of days, our duct is as good as new, and this has made our home a better place to live in. We personally recommend this company to all homeowners who are experiencing duct related problems. Okay so apart from the whole of what you have been providing here, i actually need something in relation to best dissertation service so if you can get me that, that would be amazing!! I am looking forward to your response here, thank you very much ! !